Electrical instruments first appeared at the close of the 19th century, but it was another 50 years before an affordable and widely distributed electronic keyboard became available. Its story began in the developments of the 1920s and '30s, but came to fruition in 1947 in Versailles, a part of France more famous for its palace, treaties, beheadings and references to brioche than it is for electronic music. It was in this year that a chap named Constant Martin invented a small instrument designed to be bolted under the keyboard of a piano and used to imitate orchestral solo instruments. It was the Clavioline. Physically, the Clavioline comprised two parts: a keyboard unit, which also contained the sound generator and controls, and a combined power supply, valve amplifier and speaker cabinet that looked like nothing so much as a cheap public address system. A dedicated multi-pin cable connected the two together, carrying a considerable amount of power to the keyboard to heat the valves, as well as carrying the audio signal back to the amplifier/speaker. Players could attach the keyboard to the underside of a piano keyboard using the supplied metal brackets, but had to position it carefully so that they could control its volume using the integral knee lever, while still being able to pedal the piano itself. Alternatively, for those who preferred not to mount the Clavioline under a piano, there were several stands manufactured to support it at a playable height. These ranged from a stylish collapsible tripod that seems to have hailed from the USA, to the wobbly Selmer stand pictured here. The 36-note, high-note-priority keyboard covered three octaves, from a low 'F' to a high 'E', and used three-octave dividers to derive all the pitches from a single top-octave tone generator. (Why 36 notes? Because adding the top 'F' would have required a fourth divider.) Beneath this, there was a slider that the player could push left or right using two protruding metal rods. Pushed to the left, this transposed the instrument down an octave, and to the right, up an octave. This gave the Clavioline a five-octave range, which was a big deal in the '40s and '50s. Fine-tuning of the lower and upper ranges and the instrument as a whole was accomplished using the small potentiometers mounted on either side of the base of the keyboard unit. The knee lever was a fundamental Clavioline control that could be used to generate a surprising range of expressive effects.Photo: Richard EcclestoneThe standard Clavioline offered 18 on/off switches called 'stops' on its front panel. The 14 tone modifiers were named 1 to 9, plus O, A, B, V and P, and these were augmented by four vibrato switches: I, II, III and Amplitude. As shown in the attached table, Selmer offered suggested voicings, but there was nothing stopping players from creating new timbres by combining the stops in novel ways. As for the sound itself, the valve oscillator in the Clavioline produced a harmonically rich, buzzy waveform similar to a square wave. You can hear this by setting all the stops to 'off', whereupon the unmodified tone can be heard. At least one recommended patch, the Trumpet, was based on this sound, modified with just vibrato and, of course, articulated using the knee lever. Other sounds were derived from the basic timbre by the application of high-pass and low-pass filtering. Although I have never come across an explanation of the actions of each of the filter stops, and I am far too lazy to reverse-engineer the circuits, the actions of some are quite obvious. Others one learns to use through trial and error. Although the filtering was remarkable for its era, it was the vibrato that was to become the defining factor in the Clavioline sound. This was true vibrato: in other words, modulation of frequency, rather than the tremolo or amplitude modulation that was sometimes, and inaccurately, called vibrato elsewhere. Three speeds were selected using the I, II and III switches, and two depths were available, determined by whether the Amplitude switch was on or off. This means that six vibrato settings were available, but it was the fastest and deeper of these that became the instrument's trademark. Nevertheless, none of this explains why the Clavioline had such a recognisable character, nor why it has proved so difficult to imitate, even with today's sophisticated synthesizers. The secret to this lay in its amplifier. To quote Selmer's service manual, "The Amplifier is an unusual type insofar as a large amount of distortion is deliberately obtained. This distortion is used to further modify the signal and contributes in no small measure toward the construction of the authentic tone. 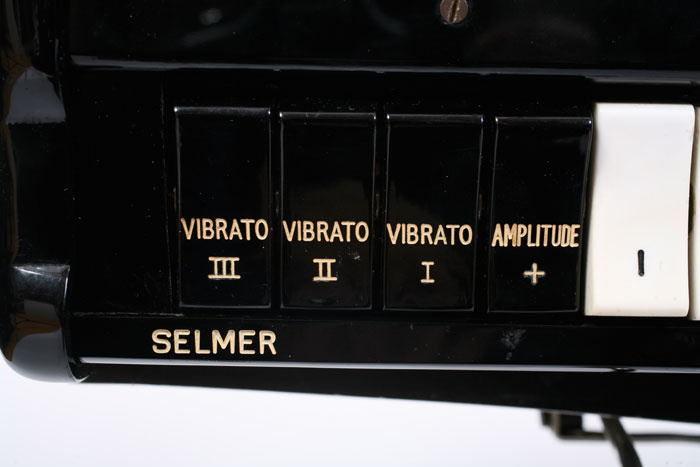 The Amplifier is, therefore, an integral part of the instrument..."
Selmer published tables of sounds for each of their Claviolines, and these acted as guides to the range of sounds that players could obtain. The table printed here combines some of the voices for a standard Clavioline with the table supplied for my Concert model. Other tables exist, but they do not always agree with these patches. Ultimately, you should decide what works best for you. Although Constant Martin invented a duophonic Clavioline in 1949, this never reached production. There were, however, numerous variations of the monophonic Clavioline: in the days before mass production of electronic keyboards and cheap worldwide shipping services, it was not unusual for patents to be licensed to companies in different countries, and instruments to be manufactured locally. As a result, there were variations of the Clavioline manufactured in the UK, the USA, Germany, Italy and possibly elsewhere. There were even versions of the Clavioline's sound generator built into large organs, but these lie beyond the scope of this retrospective. The standard Selmer Clavioline, also known as the Auditorium Model, was the basic instrument, a five-octave model that featured the 18 stops described above. Apparently, some of these models also offered two potentiometers that allowed the player to change the vibrato speeds and depths, but I have never seen one of these. A modification of the standard model was developed by Harald Bode, the inventor of the Bode Pitch-Shifter. This had an additional position on the octave selector that allowed players to shift the pitch down a further octave for bass work. 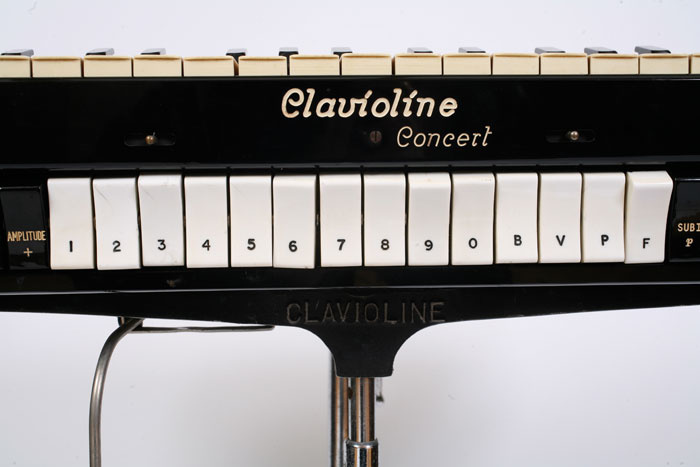 As a result, this model became known as the Bode 'six-octave' Clavioline, the name by which it is still known today. The next model was the Selmer Clavioline Concert, which offered four more stops than the standard model. Housed in a similar case to the Auditorium model, it came in a variety of coverings, but you can recognise all the versions by their wooden (as opposed to ivory) black keys. The use of wooden keys was a mixed blessing, because the glue that held the tops on was prone to dry out and lose adhesion. This means that the keys of many units have been lost, including the top D# on mine, as you can see from these pictures. Apparently, the cure for this is to cut down a genuine piano key. If you have an instrument with all its keys intact, some web sites recommend that you detach them and glue them on again using a modern glue. This is a good idea; I have accidentally popped off more than one key over the years. The four extra stops were important additions. 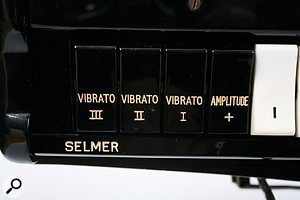 Rather than adding further variations on the filtering, Selmer used them to control additional octave dividers that output a tone one octave (Sub I) and two octaves (Sub II) below the patched voice. These could be combined with each other and any other settings, making the Concert model much more flexible than the basic Clavioline. 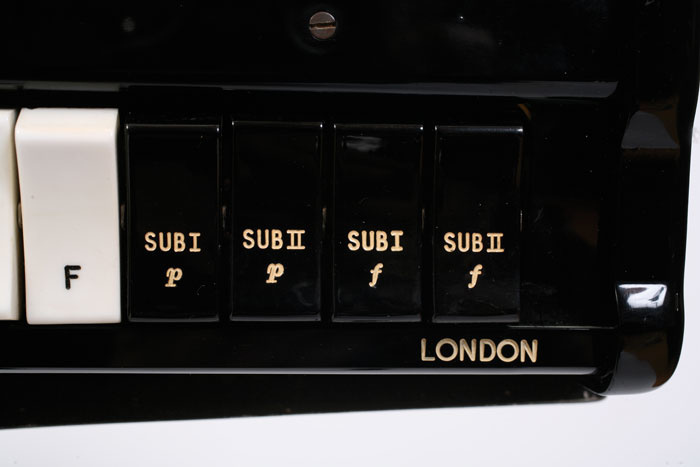 To demonstrate this to yourself, simply add the 'f' (forté) settings of Sub I and Sub II to the unaffected timbre to create a rich, organ tone that lies way beyond the capabilities of the standard models. 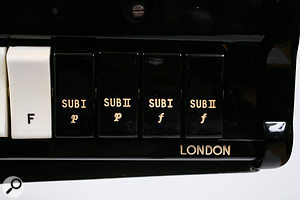 In the USA, the Gibson Standard Model was similar to the Selmer Auditorium, having the same ±1-octave tuning, 18 stops and six vibrato options as its British counterpart. However, some manufacturing improvements meant that the keyboard and speaker units fitted together better, and it also ran somewhat cooler than the Selmer. In contrast, the Gibson Concert Clavioline was instantly recognisable because it was more compact, and therefore more portable, than the equivalent Selmer. However, the reduction in size came at a cost: the electronics were less accessible, repairs became more problematic, and simple maintenance such as cleaning of the switch and key contacts was less straightforward. In late 1962, or perhaps early 1963, Selmer updated the Clavioline still further by adding a spring reverb, to create the Concert Reverb model. But despite the obvious benefits of adding reverberation to the sound, this model was short-lived and is among the rarest of all surviving Claviolines. In 1965, somewhat after interest in the instrument had peaked, a German model appeared. 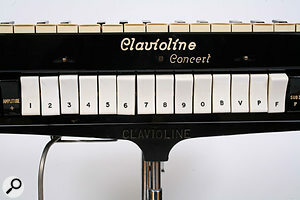 The Jorgensen Clavioline was housed in a more modern case but, with the standard complement of 18 switches, was clearly a derivative of the Selmer Auditorium. However, it included the Bode six-octave selector, making it (for some collectors) more desirable than the Selmer. Unfortunately, it appears that Jorgensen instruments were not as reliable as other Claviolines, so it is debatable whether anyone should go out hunting for one. On the other hand, should you find a Bode Tuttivox, you should snap it up (or tell me where I can do so). This was a polyphonic Clavioline with 12 individual pitch generators divided down into the usual three octaves ('F' to 'E') using 12 sets of valve-based octave dividers. Sure, its voicing was more limited than that of a monophonic Clavioline but, as the precursor of today's polyphonic synthesizers, its historical value is enormous. Most Tuttivoxes were built by Jorgensen in Germany, but it seems that there were also French and British versions. Finally, there was an Italian version of the Clavioline known as the Ondiola. A bit of a hybrid, this offered the 22 stops found on the Concert models, but also featured Harald Bodes' six-octave switch, which had previously been found only on 18-switch (standard) models. In the USA, the Clavioline appeared to come to prominence in 1961 through the music of Del Shannon, and in particular his number one hit song 'Runaway'. But it now seems that the instrument used to create the track's instrumental break — possibly the first 'synth solo' ever released on record — was not a Clavioline, but a custom instrument called a Musitron, which was assembled by Shannon's keyboard player and co-writer, Max Crook. 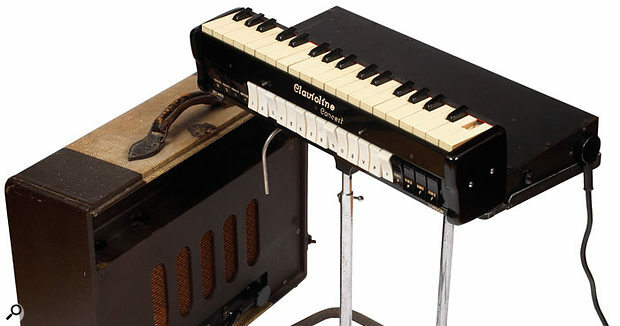 Based on a Clavioline, the Musitron incorporated numerous other unspecified electronic bits and pieces that made it possible for Crook to create a wider range of tones and special effects. Later, he was to build another hybrid, which he dubbed the Sonocon. This had pitch-bend and was also capable of generating percussion sounds that the Clavioline could not. When developed, the Clavioline was intended for use as an accompaniment instrument that produced realistic imitations of the orchestral sounds of the time: primarily solo strings and brass. In this, it was surprisingly successful, although standards of what constitutes 'realistic' have changed somewhat since the middle of the 20th century. But it was for its ability to create what were, at the time, novelty sounds that it became best known and, today, two recordings stand proud of anything else on which a Clavioline was ever used. These are 'Telstar' by the Tornados, and the Beatles' 'Baby You're A Rich Man'. Three speeds of vibrato were available, at one of two depth settings controlled by the Amplitude switch.Photo: Richard EcclestoneIn late 1962, 'Telstar', an instrumental named after an early telecommunications satellite that carried the first live, transatlantic TV broadcast, was nothing less than an audio revolution. 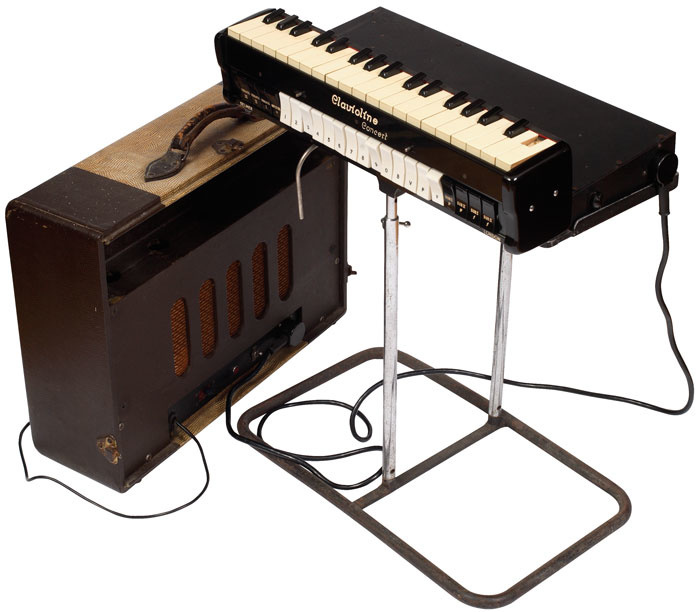 In an era of great technological daring (in music as well as space flight) making the Clavioline the lead instrument was still a bold move, and it helped to propel the track's producer, Joe Meek, to prominence. The Clavioline then became the Tornados' signature sound, appearing on lesser-known but innovative tracks such as 'Jungle Fever' and 'The Breeze And I'. The Tornados' success encouraged numerous imitators, such as Dutch band the Hurricane Strings (yeesh!! ), but none of these are widely remembered today. Then, in 1967, the Beatles released 'Baby You're A Rich Man', a seminal recording that was later to be included on the Yellow Submarine soundtrack. 'Baby You're A Rich Man' was remarkable for all manner of reasons. Firstly, it seems to have been bolted together from two unreleased Beatles tracks (one apparently by Lennon, the other by McCartney) written the previous year, and it was the first track that the band recorded away from their home-from-home, Abbey Road. Secondly, the backing vocals were sung by Mick Jagger of the Rolling Stones. But it was for John Lennon's possibly drug-induced experiments on the Clavioline that it is best remembered, with one apocryphal story suggesting that he created its memorable wail by rolling an orange up and down the keyboard! The Hammond Solovox was perhaps the most famous of those keyboards that were almost, but not quite, Claviolines. Predating the Clavioline by as many as seven years (sources are not entirely definitive on the dates, and I wasn't around to confirm things one way or the other) it too was intended for fixing under the keyboard of a piano, and employed a single valve-based, square-wave oscillator, octave dividing, and controls to modify the timbre of the sound. However, the Solovox lacked the octave switch of the Clavioline, which limited the uses to which it could be put, and, more importantly, was a much heavier beastie, with a large amplifier/speaker cabinet that was far less manageable than the neat enclosure of the Clavioline. Nonetheless, it is a legendary instrument that some collectors will hunt down at almost any cost. Of greater musical importance was the Ondioline, another three-octave instrument with a large speaker cabinet, but in this case one that could be transposed by five octaves to cover a remarkable eight-octave range. Invented by Georges Jenny, who hand-built them as well as supplying them as kits, some were let down by the use of cheap components that made them unreliable. This is a great shame because, unlike the Clavioline, the Ondioline had superb performance capabilities, with a touch wire that allowed players to trigger a short-decay envelope for percussive effects, and a pressure-sensitive keyboard that added vibrato if you wiggled the keys from side to side. In the right hands, the Ondioline's ability to imitate orchestral instruments was unbelievable. For examples of this, check out the recordings of Jean-Jacques Perrey, who used it extensively in the '50s. In addition, the 1957 ambient album Prelude Au Sommeil (recorded as a therapeutic aid for hospitals and mental institutions) featured layers of Ondioline, and it's possible that a restored version will be released in 2007. I have a dub of the original and, if you have any interest in the history of electronic music, I recommend that you obtain a copy if and when the CD appears. Other instruments in the same vein included the Lipp Pianoline with its full-sized keys (a huge benefit! ), the Combichord (Harald Bode's hybrid of a Clavioline and a Tuttivox) and the Jennings Univox, which looked much like a standard Clavioline, but differed in that its voicing was based on a sawtooth wave rather than a square wave. Finally, honourable mention must be made of the Maestrovox. This shared many attributes with the Clavioline, having similar vibrato modes but fewer stops. Released in 1952, there were at least four models — the Consort, Consort Deluxe, Coronation and Orchestrain — but the Maestrovox must count as one of the rarest of all electronic instruments, with just 10 units still known to exist. Claviolines and their derivatives were sold until the latter half of the '60s, which means that the youngest of them are now entering their 40s. Nonetheless, finding one is not hard in 2007: they appear fairly regularly on eBay and in the free ads of local papers. But buying one that is in good condition and still works perfectly is far less straightforward, because most are riddled with problems. One obvious fault is that of broken keys. Even tougher to fix are broken rocker switches. These become very brittle over the years, and are liable to crack in the area around the pivot. If one does, it will pop off its axle, and experience shows that it will then disappear to the great broken component repository in the sky. Another obvious fault is that of dead notes. If you're tempted to buy a Clavioline that has one or more of these, don't let the seller fob you off with the excuse that 'it's just dusty inside'. Likewise, don't assume that complete silence indicates just a blown fuse or something equally simple. Tracking down faults in antique circuits is not always straightforward, and obtaining replacement parts may not be easy. On the other hand, routine maintenance is not onerous, and it's much simpler to recognise burned resistors or swollen capacitors than it is to spot a defunct surface-mount chip in a modern synthesizer. Fortunately, most Claviolines were supplied with a service manual and a wiring diagram. Unfortunately, the majority of these have disappeared in the intervening years. If you own a Clavioline and have the opportunity to acquire the appropriate versions of these documents, don't hesitate to do so. If nothing else, they should help you to keep the aforementioned key and switch contacts clean, ensuring that the instrument plays well and stays in tune. It's hard to overestimate the importance of the Clavioline. The literature of the time described its function as "Synthetic musical reproduction" and stated that "every orchestral instrument could be imitated. In addition, the Clavioline as we know it today produces scores of electronic tones which have no instrumental counterpart." While, in retrospect, these claims may have been a tad optimistic, this may well have been the first time that the concept of audio synthesis entered the perception of the general public, and it did so more than a decade before Bob Moog's earliest dabblings with voltage control and modular synthesis. In addition, the character of a well-maintained Clavioline remains a revelation, and my Concert model still offers a depth and animation of sound that is hard to obtain from modern synths and workstations. If you have the opportunity to add a Clavioline to a suitable composition, you'll find that it adds colour and stands out in a way that most other electronic instruments do not. Maybe it's time for someone to create a physical model of the Clavioline and offer the resulting instrument as a soft synth. If it were anything like as characterful as the original, I would buy it! Special thanks go to Morgan Fisher for some of the more obscure facts in this article. Despite looking rather Heath Robinson in their construction, Selmer Claviolines were built to high standards. Valves were soak-tested before use, and many components and assemblies were immersed in water to test their insulation and resistance to high humidity. It shouldn't be surprising, therefore, that so many have survived to the present day, even though abuse and neglect have ensured that most are in less than ideal condition.